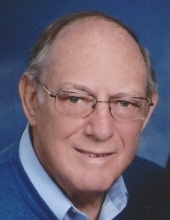 Schram, Ronald Glen - Age 83, of Grand Blanc, died April 5, 2019 at their winter residence in Sarasota, FL. Funeral service will be held 11AM Saturday April 13 at Sharp Funeral Home & Cremation Center 6063 Fenton Rd. Flint. Rev. Dr. Joseph Novak officiating. Interment at Evergreen Cemetery, Grand Blanc. Visitation will be held 2-7PM Friday and from 10AM Saturday until the time of service at the funeral home. Those desiring may make contributions to the First Presbyterian Church 746 Saginaw St. Flint, MI 48502, Holly Presbyterian Church 207 E. Maple St. Holly, MI 48442, or the charity of ones choice. Ron was born in Pontiac on March 8, 1936 the son of Cecil and Margaret Schram. He was a 1954 Holly High School graduate and served in the U.S. Navy from 1955-1957. Ron married the love of his life, Marge Doty in Holly at the Presbyterian Church on August 25, 1956. He started his career at Michigan Bell now AT&T retiring after 33 years of service in 1989. Ron was a member of the First Presbyterian Church in Flint, Pioneers of America and MARPS. His hobbies were building model airplanes and electrical projects, he also enjoyed biking. Ron had built an a.m. radio and console tv. In his later years he enjoyed computers, outdoor work, home improvements and times with family and friends. Ron took pride that things were done right. In retirement years, Ron and Marge traveled to many places. Their 25th anniversary was a special trip to Hawaii. Most years were enjoyed in their winter home in Florida. Ron will be deeply missed and live in our hearts forever. Surviving are: his beloved wife, Marge of 62 years of Grand Blanc; daughter, Julie (Terry) Schram - Parish; grandson, Andrew Downey; granddaughter, Angel Vliet, all of Burton; sister, Carol Phelps of Flint; sisters-in-law, Mary Renico of Grand Blanc, Kay Long of SC., and Ellen Schram of AZ. ; several nieces, nephews, cousins, and many dear friends. Ron was preceded in death by his parents; brother, Don; sister, Evelyn. Tributes may be shared at www.sharpfuneralhomes.com. To send flowers or a remembrance gift to the family of Ronald Glen Schram, please visit our Tribute Store. "Email Address" would like to share the life celebration of Ronald Glen Schram. Click on the "link" to go to share a favorite memory or leave a condolence message for the family.